See that light on in the office up on the 12th floor? That’s me the editor, burning the midnight oil. It was my first job when I moved to Boston from San Francisco. This is the little house on the prairie – not – where I wrote The Naked Computer, my first bestselling book. I’ll never forgot the day my co-author John Gantz and I learned we were born on the same day, five hours apart. The floors sagged, but my writing career sure didn’t. This was where Dennis Driscoll, Computer Crime Private Eye, was born and first saw print. I also began my love affair with serious bicycling here. What a great place the Museum of Science was to celebrate the publication of my first book about computers. Most books about computers then were serious, but the New York Times review characterized ours as like eating jelly beans. Dennis Driscoll, techno-gumshoe! He was the first computer crime private eye I know of. Or at least whom I wrote of. Raymond Chandler would have liked his wry, ironic way with the world. 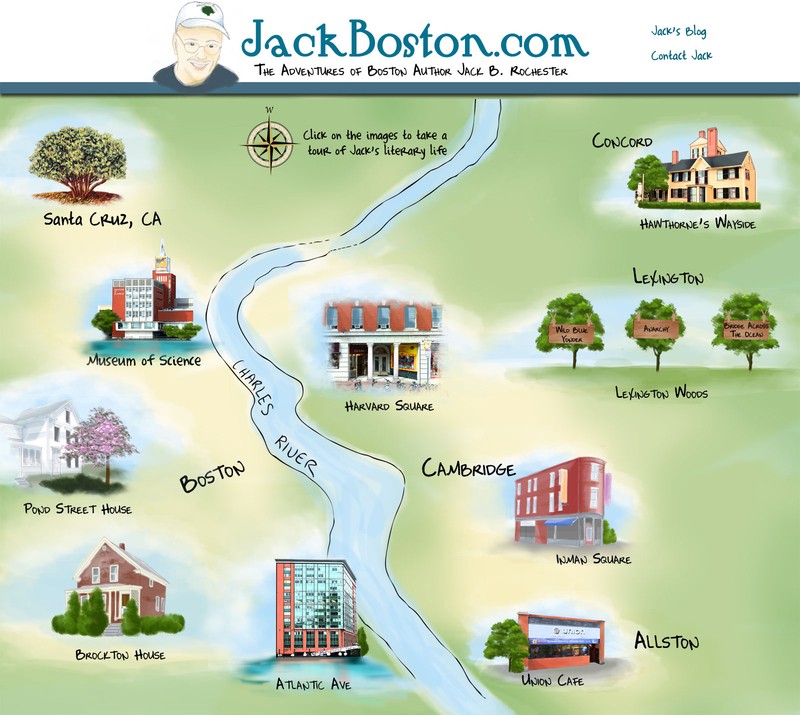 Everybody needs a sense of place, which is what the JackBoston map is all about in general and what my fictional private eye characters are about in particular. Cambridge is cool. It’s their place. A sense of place is important to most people. Think “the land is the only thing in the world worth working for…” remark in Gone With The Wind. There are two very special places for me in Concord. One is Nathaniel Hawthorne’s house, The Wayside, and the other is Henry David Thoreau’s Walden Pond. Do you anthropomorphize trees? I do. Can’t help it. Madrones. Redwoods. Maples. Birch. I’m so in love with trees that I’ve named the maples outside my home after my novels. Not sure what will happen when I’ve written the next novel and I’m out of trees. My two major passions are writing and cycling. Besides the workout that comes with riding, I often work out a lot of plot and character stuff on the bike. It’s pure, spontaneously contemplative, and often problem-solving time with my ideas.